Recording the Buddha’s teachings was perhaps the most important legacy left to us by the Buddha’s followers of monks and nuns. The Tripitaka (its name in Sanskrit) or Tipitaka (in Pali) are a large body of the Buddha’s teachings that were recorded after the Buddha’s passing away. 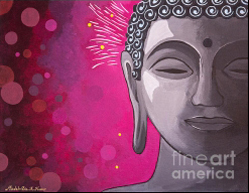 It was at the First Buddhist Council that the Buddha’s teachings were first recalled and committed to memory. The Tripitaka (also known as the Pali Canon) is composed of the Vinaya, Sutras and Abhidhamma (or Abhidharma). These form the foundations for what are considered some of the most important Buddhist scriptures. There is no single book that can be pointed to as a ‘Buddhist bible’, rather there are volumes of teachings that are attributed to the Buddha, and you would need a whole bookcase to house them all. Fortunately, there is no requirement for a Buddhist practitioner to read the whole Pali Canon, and Buddhist literature is not limited to the Pali Canon alone, but they possess some of the most fundamental teachings required for a basic Buddhist education (namely, The Four Noble Truths and Noble Eightfold Path). In the Suggested Reading section of my website you can find many great Buddhist books I highly recommend reading.